Have you noticed your heat registers and cold air returns vents collecting dust? Do you have airborne allergies? Is your home always dusty and your furnace filter dirty and in need of replacement? Air ducts are a favorite place for dust, lint, pet dander, pollen, dead insects, bacteria, fungus and much more fallen debris to accumulate. When air is pushed through your air ducts by your furnace or air conditioner these harmful elements in your air ducts are released into the air that you and your family breathe. Dirt buildup prevents the proper circulation of warm and cool air, forcing your heating and cooling system to use more energy Cleaning your air ducts improves the air quality in your home, making you more comfortable and your home cleaner while allowing your furnace to run more efficiently and saving you money. Healthy Home Pest Control and Services technicians will clean your air duct system and remove the unwelcome dirt particles and pests that live in your air ducts. We clean the air ducts using industrial hoses run from our high-powered vacuum truck that pulls in approximately 10,000 cubic feet of air per minute (CFM). All warm and cold air registers receive special attention and are cleaned separately with a hand blower. Dust and debris are knocked loose into the air duct where its controlled and vacuumed directly out to our high powered vacuum unit. Extra care is always taken to prevent carpets, floors and furniture from being soiled. The when and the why you should you have your chimney cleaned: For safety, a fireplace chimney or wood burning stove should be inspected yearly and cleaned after every 1 – 2 cords of wood burned. Pellet stoves should also be inspected yearly and have the soot buildup cleaned. 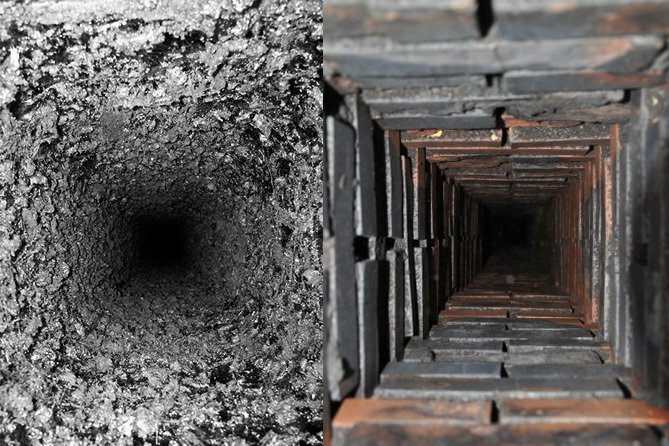 Before we sweep your chimney we do a visual check to be sure that your chimney is in need of a cleaning, a chimney or flue with more than a 1/8 of an inch of creosote or soot buildup needs cleaned. Creosote is a corrosive and combustible substance that is the by-products of burning wood and the buildup of creosote is the major cause of chimney fires. At Healthy Home Pest Control and Services our cleaning process leaves your home soot and dust free. We put down drop cloths, cover the fireplace and use a high powered vacuum to keep any mess contained to our equipment. Using a special wire or poly chimney brush on 5’ long flexible pole we clean your chimney from the inside, bottom to top to ensure the dust is contained. We brush the firebox build-up, and our vacuum catches all the freed creosote and debris. Our chimney cleaning service include a full visual inspection of the fireplace, firebox, chimney, damper and liner. If warranted, we run a camera inside your chimney to identify possible problems seen in the visual inspection. If we find any issues or potential problems during the cleaning or the inspection, we will provide you with information on how it can be remedied. Healthy Home Pest Control and Services never use chemicals when cleaning a chimney; we use special equipment and take extra care to keep soot, creosote and debris from entering your home.